Libraries and Vounteering, would you serve on a board? My TBR shelf where my books breed. As usual, Saturday included a trip to the local library. And as usual I gave them a big bag of books. I have no idea where all these books are coming from as I do not collect books just to have them. I think my books may be part rabbit; they seem to be frequent breeders. I clear my shelves only to find more books lying around. I almost have my discards down to a manageable minimum. 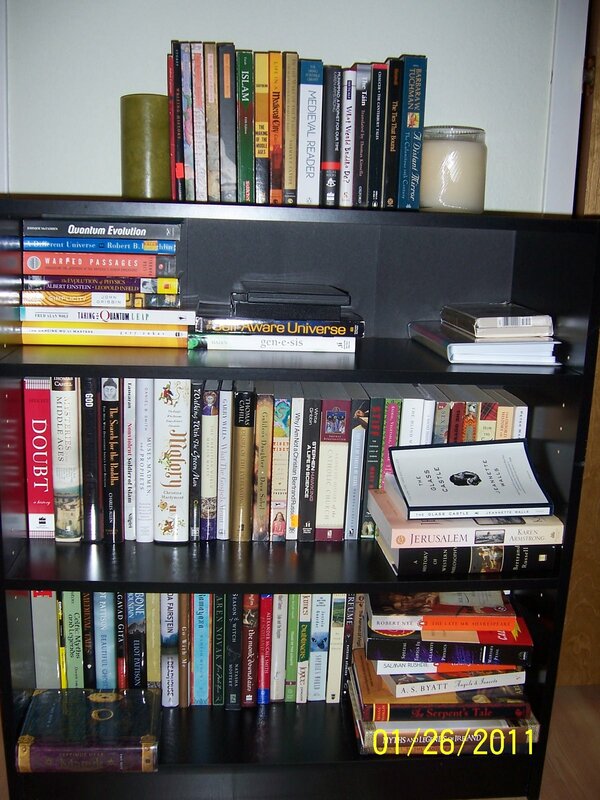 And soon may see the bottom shelve in my office. I headed to the library to return 20th century ghosts by Joe Hill and to pick up Peter Ackroyd’s newest, The Casebook of Victor Frankenstein. When I walked in I almost jumped for joy; I know I certainly made a noise, as sitting right there in front of me in the New section was Craig Ferguson’s American on Purpose. This is a book I have had on my wish list for almost a year now. I grabbed it and the Ackroyd book. I am really starting to appreciate my local library. In the past it seemed getting books that ran along my reading taste was rare. Now it seems every few weeks they are displaying books that I would have felt for certain they would not carry. I feel as if the library is catering to me. Perhaps my long volunteer hours are paying off, or perhaps my reading taste is expanding. How can it not dear Readers, when you all post such wonderful reviews on your blogs? My wish list is ever-growing thanks to you. What would you write on a library board application? How do you feel you could make a difference to your local library? Would you even want to be part of a board? Do tell! I'm afraid I'd be at a loss as to what to say, Sari. All of your ideas are good ones though! I had a friend who was on her local library board for years and while she loved it at times, she hated it at others. She often found she and one other person on the board were doing all the work while the others just didn't care. I think having a good team really makes a difference in situations like that. I wish you luck with your application! I think you'd be a great asset to have on a library board. You would be great for the library board, you should say all of the above.Ackroyd's Frankenstien is an interesting variation on the original. Will you be reading the new Pullman, The Good man Jesus and the scoundrel Christ, I thought of your special interest in religion and I wondered what you will make of that one. I am tossing up whether or not to order it or wait for the library to get it in.Good luck with the library! Wendy, Thanks. I am sure as the newbie I would be asked to do a lot on the board. Many have been there for years. On the other hand I guess it would be easy to push things on the newbie LOLSharon, thanks for the suggestion. I will see how much I can put into a short essay. No, I had not heard of the book until you mentioned it. I looked it up and it sounds interesting. I have wondered myself how much the the "Christ" was real and how much it is made up. I will see if I can get my hands on it. If you read it I would love to hear your thoughts on it. I think it would be an interesting role, I myself have only recently joined he library and I have to say that Im impressed. Almost all the time I go there I find something on my wishlist. Your thoughts are excellent–go for it, but it is true often one person ends up doing the majority of the work. (The same I found true with library "friends groups". Jessica,This is great! Libraries are wonderful places where readers can find new and exciting reads. I am glad you find books on your wishlist. I am always happy when I find one of mine. Diane, I was part of the friends group and found I was the one working the small book store every Saturday. I did not mind, for the first year, but after that it did get a little old. When we have book sales I do see the same people working it and wonder what all the other friends do. As a book lover I would LOVE to be on a library board.I also just borrowed the Peter Ackroyd book from a library. Have you read it yet?